Thanks to a reader for emailing this story to me, which follows up on the Friday story we posted [Oct 31: Bloomberg - Credit Tsunami Swamps Trade] For whatever reasons many shipping companies are Greek based, and the historic drop in the Baltic Dry Index has been used as a proxy indicating a coming (current) global recession. The Baltic Dry Index measuring rates for coal, iron ore, and grains, and other dry goods plummeted below 1000 yesterday, down 92pc since peaking in June. The daily rental rates for Capesize big ships have dropped $234,000 to $7,340 in weeks, leaving operators stuck with heavy losses on long leases. Empty ships are now crowding Singapore and other global ports. "It is extremely serious, " said Jeremy Penn, president of the Baltic Exchange. "Freight rates have never fallen this steeply before. It is telling us that world trade in raw materials has slowed dramatically. 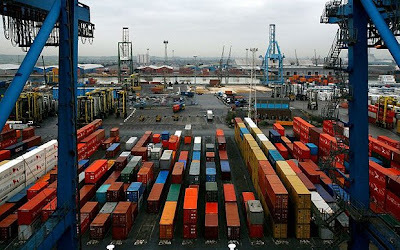 Shippers are having genuine difficulty obtaining letters of credit from banks," he said. It is also beginning to cause strains in Greece, where the yield spread between Greek 10-year bonds and German Bunds rocketed to a post-EMU record of 123 basis points yesterday. Ominously for Greece, this is the first time its debt has broken its tight linkage with Italian bonds – which traded at spreads of 100 yesterday. The markets are now clearly singling out the country as the most vulnerable of the EMU members. "Shipping has overtaken tourism to become the country's biggest industry. They get their finance from other countries, so I think there are going to be a lot of worried bankers in London," he said. Shipping specialists say the Royal Bank of Scotland and HSBC provide the lion's share of loans for both the bulk goods and tanker fleets, exposing these two banks to further potential losses. Greek shipping families control a third of the global freight market for bulk goods, with operations split between London and Pireaus. Michael Klawitter, a credit strategist at Dresdner Kleinwort, said the market flight from Greek bonds marked a dangerous moment for the euro. "There has been a massive widening of spreads. We are no longer having a theoretical discussion about the viability of monetary union. People are really concerned for the first time," he said. Greece has a current account deficit of 15pc of GDP, the highest in the eurozone. Investors were willing to turn a blind eye to this during the credit boom, but they have now become wary of any country with a deficit in double digits.